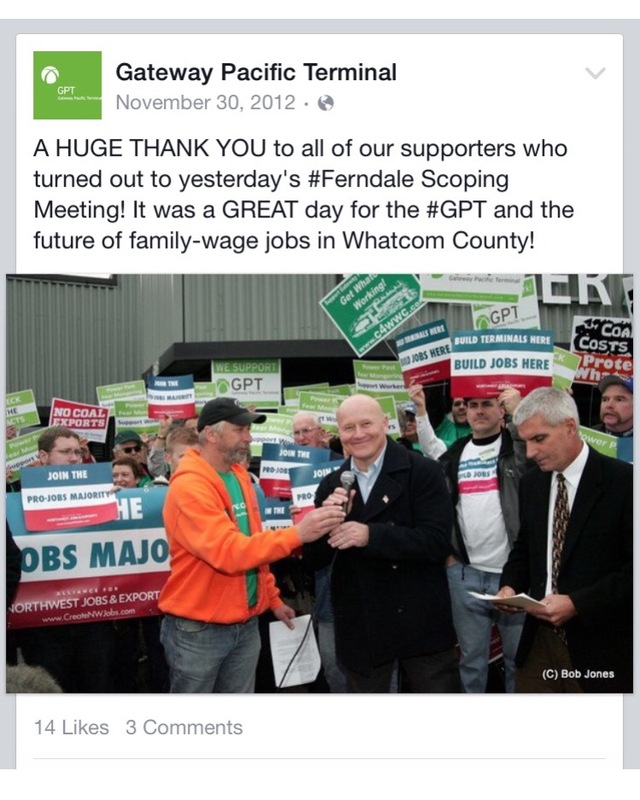 After reading their 2015 Whatcom County Voters’ Pamphlet, some voters could wonder if Port of Bellingham Commissioner candidate Gary Jensen’s pants are on fire. 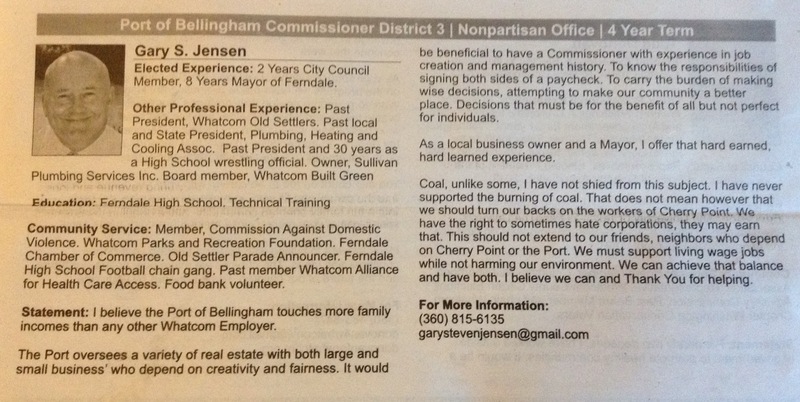 Current Ferndale Mayor Gary Jensen’s candidate statement in the “Whatcom County Official Local Voters’ Pamphlet” seems to be an odd manifesto which contradicts the mayor’s actions. 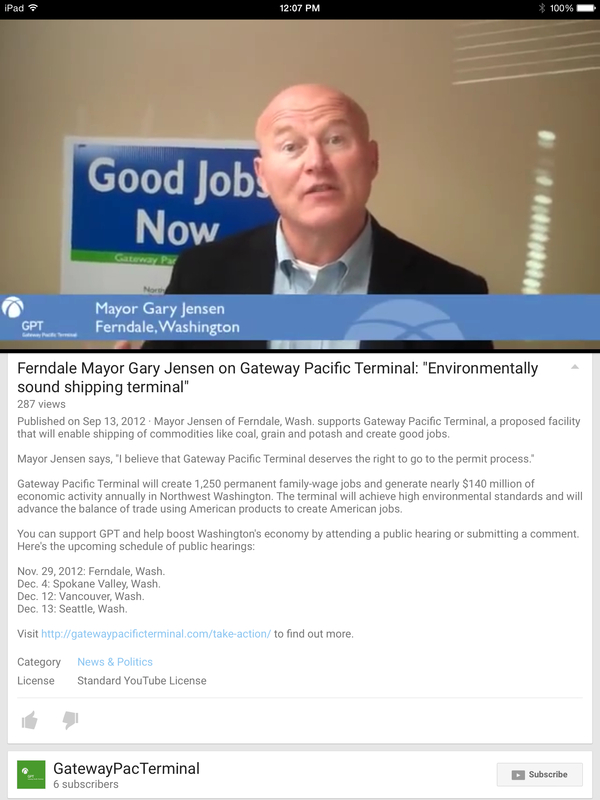 There is no doubt as to Gary Jensen’s support for burning coal when since 2011, he has been arguably the most public supporter of the Gateway Pacific Terminal (GPT), proposed in Whatcom County, Washington, which, if built, would be the largest coal export terminal in the United States. 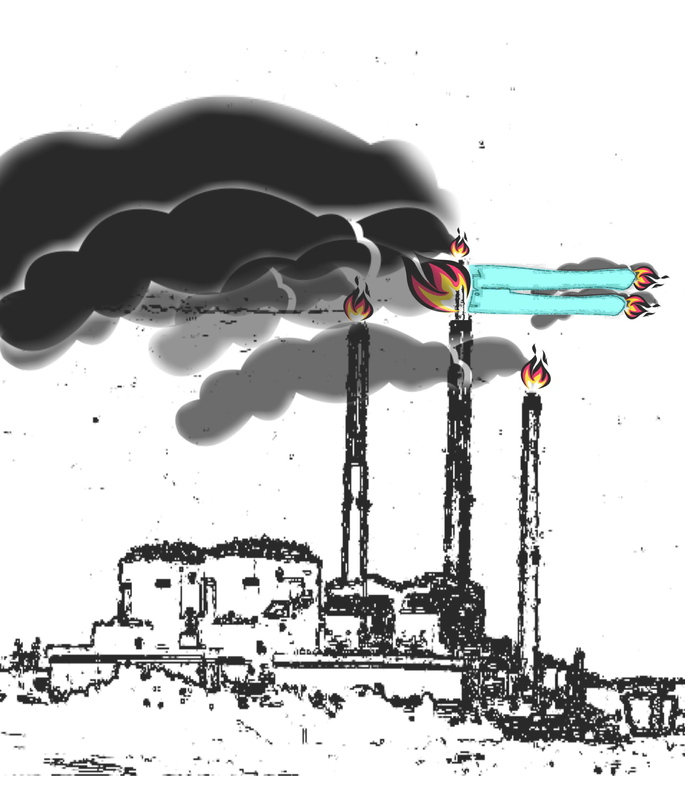 Was Gary Jensen’s decision to support a 48 million ton coal export terminal along the Salish Sea a wise decision? Does he think that agreeing to let SSA Marine use him during his time as mayor, in its multi-media advertising campaign for the terminal, was a wise decision? 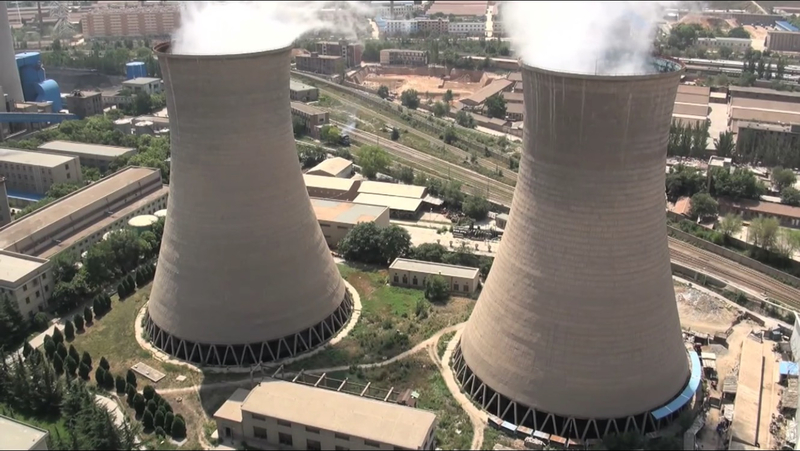 Will a huge coal terminal really make our community a better place? “Not perfect” would be quite an understatement to describe how GPT’s adverse impacts would affect individuals of the Lummi Nation. The Lummi, a Coast Salish people, are the original inhabitants of Washington State’s northernmost coast and southern British Columbia. Their reservation abuts Xwe’chi’eXen, which is the Lummi peoples’ ancestral name for Cherry Point. 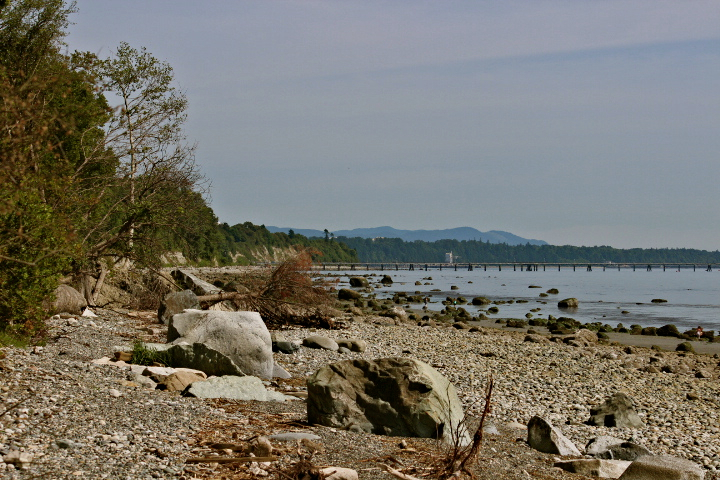 The proposed location for GPT is along the Salish Sea, at Xwe’chi’eXen (Cherry Point), an ancestral archeological village site and herring spawning ground. Herring are a critical forage food for salmon on which the Lummi peoples’ survival and culture have depended since time immemorial, but salmon are now severely threatened after salmon stocks have drastically declined. The herring population has also drastically declined (more than 92%) between the 1970s and 2012. Xwe’chi’eXen was the first site in Washington State to be listed on the Washington Heritage Register and it’s eligible for the National Register of Historic Places. Xwe’chi’eXen holds deep cultural, spiritual, and historical significance for the Lummi people. Mayor Gary Jensen’s Whatcom County Voters’ Pamphlet statement is not the only kindling under his pants afire. Below is more fuel, some of it from articles already published by this author. Some of the history of Mayor Jensen’s support of GPT which began in 2010, long before the public was even made aware of the proposed project, deserves a review. In June 2010, Mayor Jensen, along with six other people, signed onto a June 15, 2010 letter. The letter project was orchestrated by SSA Marine’s paid local spokesperson on the GPT project, Craig Cole. The letter was sent to Washington State’s Public Lands Commissioner Peter Goldmark, who heads up the Washington State Department of Natural Resources (DNR). The six other letter signers were; SSA Marine’s paid local spokesperson on the GPT project Craig Cole; Whatcom County Public Utilities District Commissioner and President Jeff McClure; then-mayor of Blaine Bonnie Onyon; then-Washington State Senator for 42nd District Dale Brandland; former mayor of Bellingham Tim Douglas; and then-President of the NW Washington Central Labor Council, who eventually became the Co-Chair of the Northwest Jobs Alliance Dave Warren. The letter expressed an immediate concern that DNR’s Draft Cherry Point Environmental Aquatic Reserve Management Plan could deny an opportunity to permit SSA’s proposed GPT project, and appealed to Goldmark to remove what SSA and Cole et.al. considered to be inherent conflicts in DNR’s draft plan. They also wanted the plan language in the draft changed so that the requirement for future or on-going studies would not cause any delay in permitting and leasing decisions made by DNR on SSA’s proposed GPT, as well as modifications to current industrial facilities located at Cherry Point. Mayor Jensen also signed onto a pre-written op-ed that was orchestrated by SSA consultant Craig Cole which was published in The Bellingham Herald on July 3, 2010. 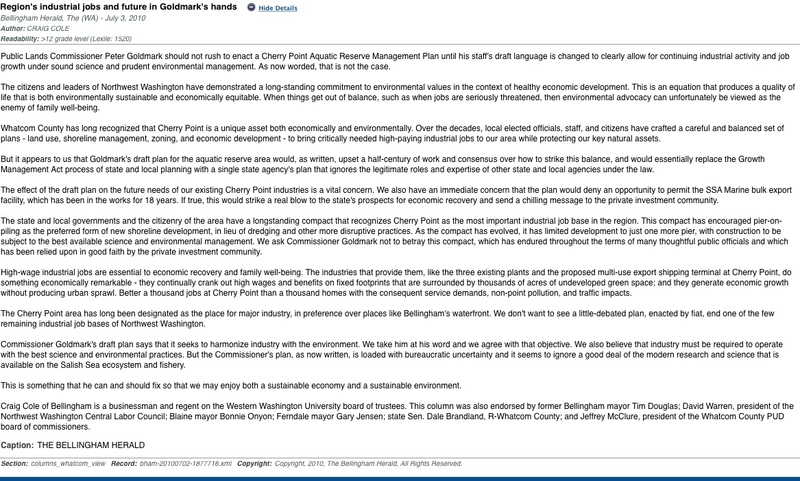 The opinion piece was a pressured public appeal to Washington State’s Public Lands Commissioner Peter Goldmark, asking him to change language in the draft of the Cherry Point Environmental Aquatic Reserve Management Plan. The plan was being updated at that time in 2010 by the DNR, which manages state-owned aquatic lands. The plan had been enacted in 2000 to protect the sensitive and unique aquatic ecosystem at Cherry Point in the Strait of Georgia. 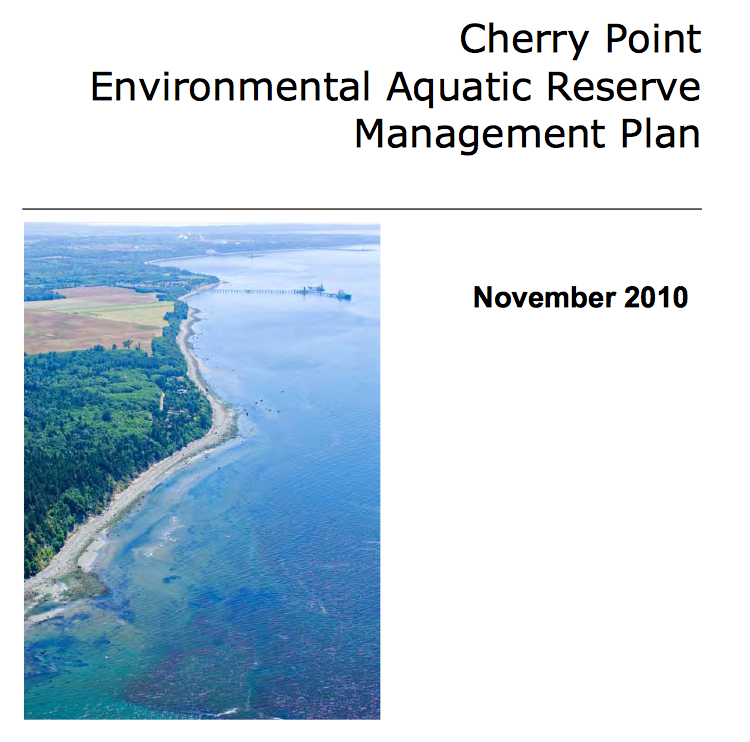 The Cherry Point Reserve and its management plan was/is a potential roadblock to SSA Marine for its GPT project proposed at Cherry Point. On February 20, 2011, a print advertisement for the GPT project was featured in the Sunday edition of The Bellingham Herald. 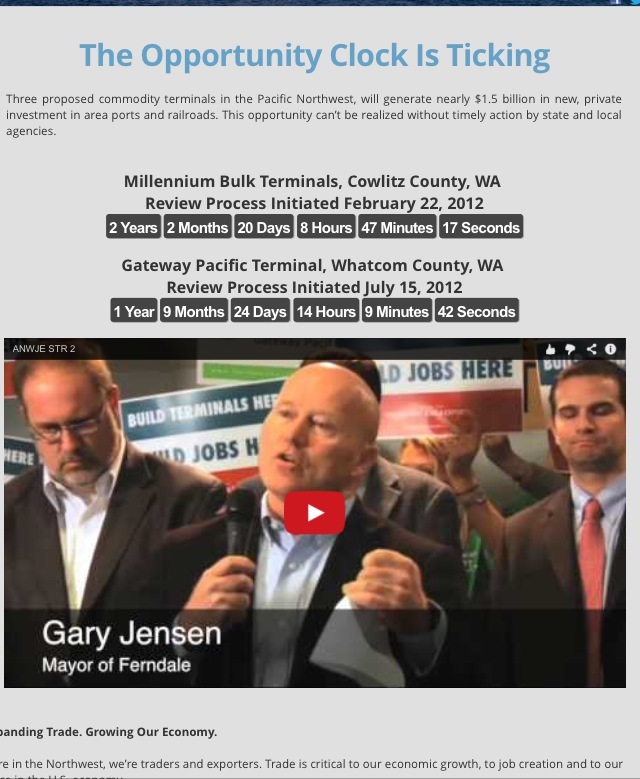 Gary Jensen, as a sitting mayor, allowed himself to be used in that ad by SSA Marine. 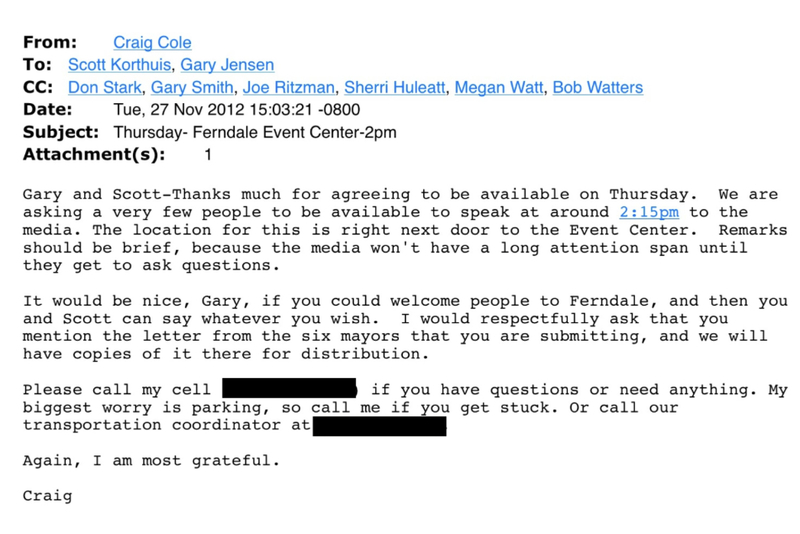 Public records obtained from the City of Ferndale, show that Mayor Jensen, along with Lynden Mayor Scott Korthuis, was sent a February 15, 2011 email from Gary Smith, a partner at Smith & Stark Strategic Solutions, a Seattle-based public affairs and strategic communications firm hired by SSA Marine. 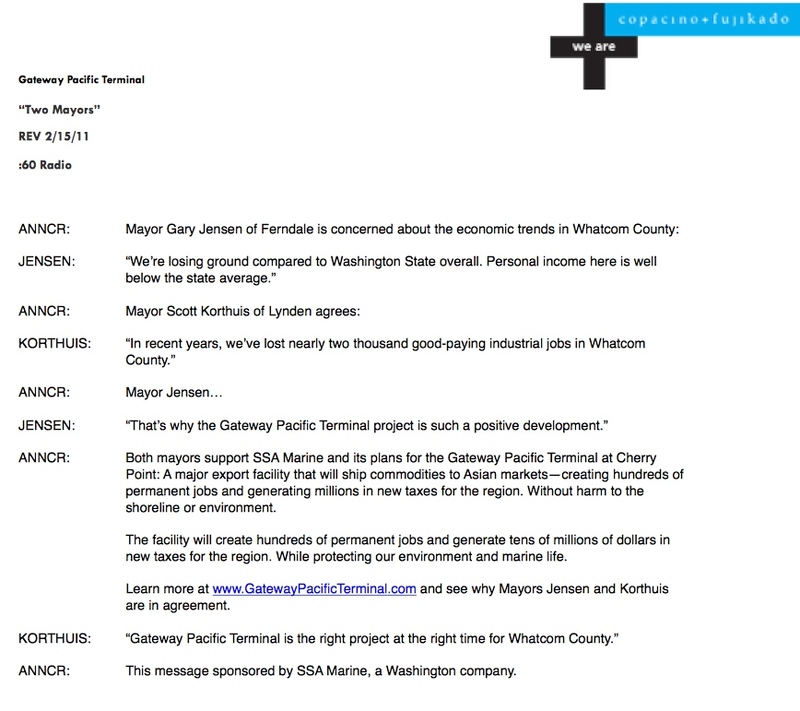 In his February 15 email, Gary Smith asked mayors Jensen and Korthuis for their approval on the final copy for a GPT print ad which he said was slated to run on February 20, 2011, in The Bellingham Herald, and for the mayors’ approval on the final copy for a GPT radio ad which was also slated to run that week. Both Mayor Jensen and Mayor Korthuis also gave their approval, allowing Smith & Stark, along with Copacino + Fujikado, a Seattle-based advertising agency working in tandem with Smith & Stark, to use the mayors’ likenesses, photographs, and voices in advertising for SSA Marine’s GPT project. So, Mayor Gary Jensen let himself go on record for supporting the GPT project in an ad that claimed there would be no “harm to the shoreline or environment,” from the project. People might be wise to question the responsibility of an elected official to have allowed himself to be used to sell such a proclamation to the public. Mayor Jensen was featured in pro-GPT ads in print, radio, video, GPT and its public relations-created advocacy groups’ websites and social media. 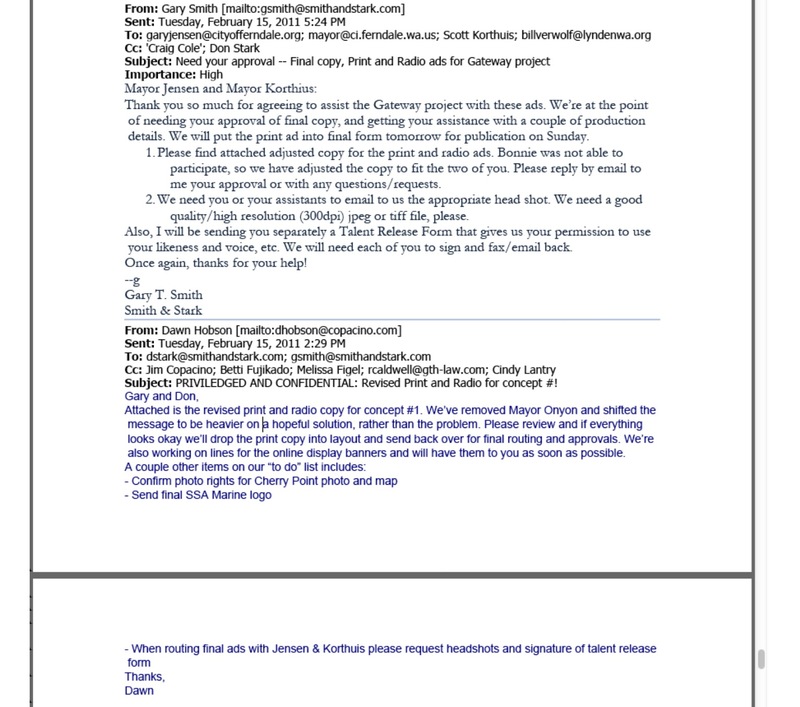 Email records show that SSA consultant Craig Cole sent a June 26 email to Mayor Jensen, asking him to do an interview with TVW, a Washington State public affairs network, for a series the network was doing on the GPT project. Email records showed that Jensen was interviewed by TVW for the GPT series on July 11, 2012. 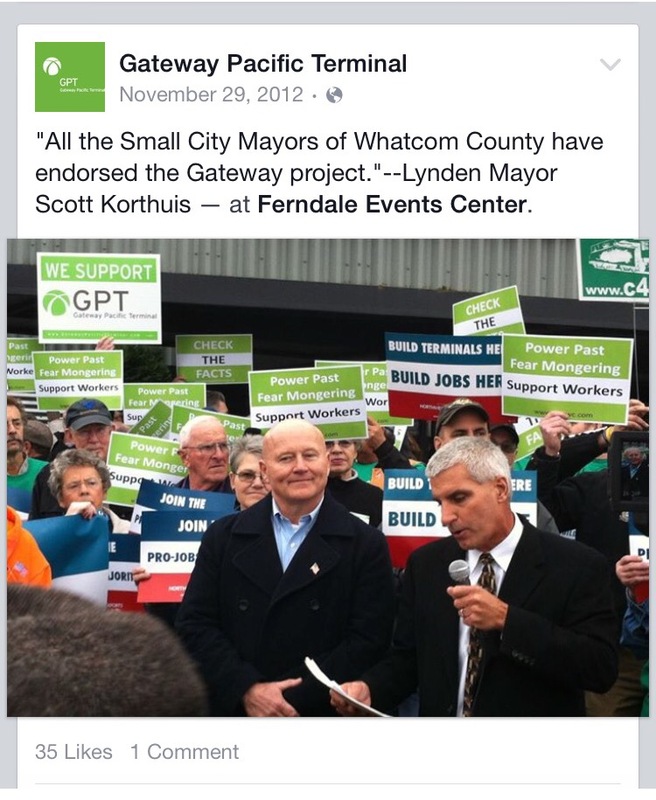 According to a November 27, 2012 email from Craig Cole to Mayor Jensen and Lynden Mayor Scott Korthuis, Cole asked the mayors to address the media that would be gathered for the November 29, 2012 Environmental Impact Statement (EIS) scoping hearing for GPT held in Ferndale. Cole specifically requested that the mayors mention to the media, the letter from the six Whatcom County small city mayors which they would be jointly submitting during the hearing as a scoping comment in support of GPT. At the November 29 EIS scoping hearing for GPT, Mayor Jensen was the recipient of speaker slot #1 thanks to SSA’s public relations firm/s paying day workers to stand in line early that morning so they could hold a spot for him, and for about fifty other GPT proponents including numerous elected officials, labor leaders, and business leaders. There had been a limited number of speaker slots so that only the first hundred or so people who lined up were able to testify to the EIS agencies and public at the hearing. 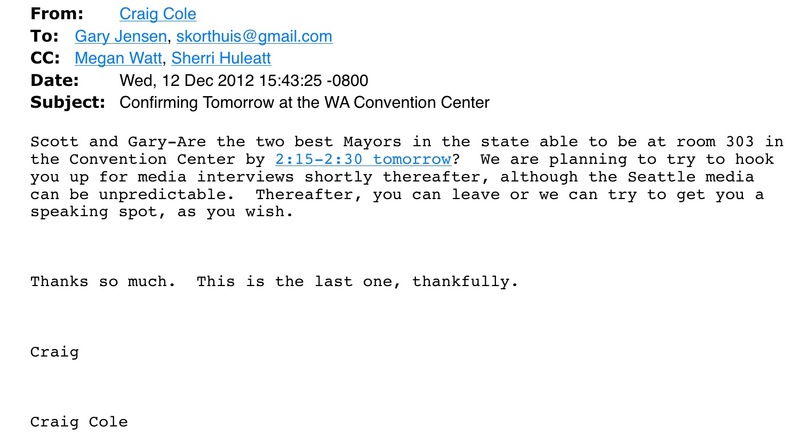 On December 12, 2012, Craig Cole sent an email to Mayor Jensen, asking him if he would travel to the Seattle December 13 EIS scoping hearing for GPT, to speak to the media there, in support of SSA’s GPT project. In his dogged loyalty to SSA Marine, Mayor Jensen traveled to Seattle to address the media, expressing his support for the project. 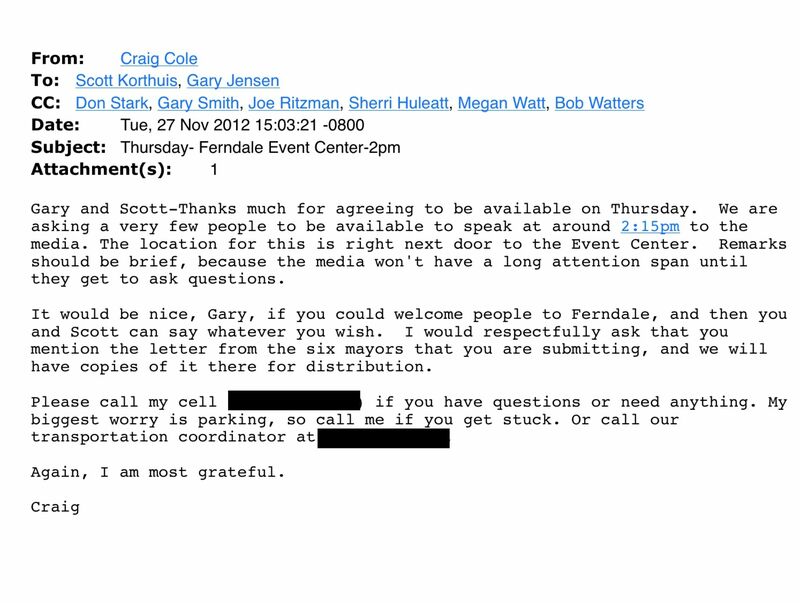 Records also show a December 11, 2012 email sent from Craig Cole to Mayor Jensen, asking him to do a radio interview the next day on December 12th, with conservative talk radio host, John Carlson of Talk Radio 570 KVI, which the mayor agreed to do. In December 2012, Craig Cole and Smith & Stark spoon-fed a pre-written op-ed to Mayor Jensen for his approval for him to submit to The Bellingham Herald for publication. 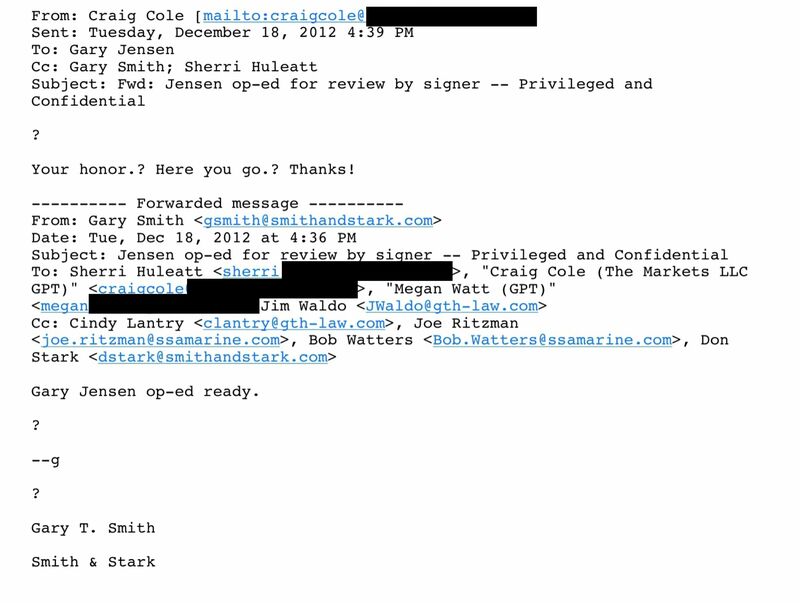 Smith & Stark partner Gary Smith, sent a December 18, 2012 email to Craig Cole (and copied SSA Sr. VP Bob Watters and SSA VP of Business Development Joe Ritzman) with the op-ed ready for Jensen’s review. Cole then forwarded it to Mayor Jensen a few minutes later, for the mayor to review and approve, as the supposed author of the opinion piece. 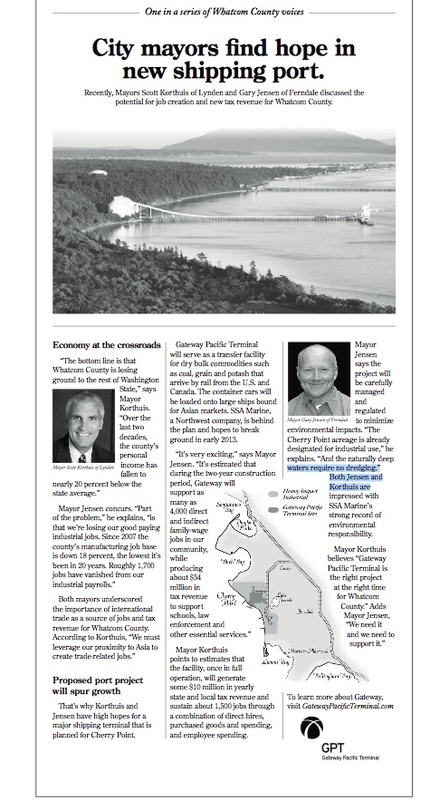 The op-ed, entitled, “Gateway Pacific Terminal will make a great neighbor,” was published in the Herald on December 21, 2012, and the author listed was Mayor Gary Jensen. During the 2013 County Council election season, Mayor Jensen authored a September 18, 2013 op-ed which strongly criticized the Whatcom Democratic Central Committee’s resolution it passed on July 18, 2013: “The Resolution to Honor the Lummi Nation’s Sacred Lands and Waters at Cherry Point.” It was an honorary resolution in support of the Lummi Nation protecting its sacred lands and sacred waters at Cherry Point. 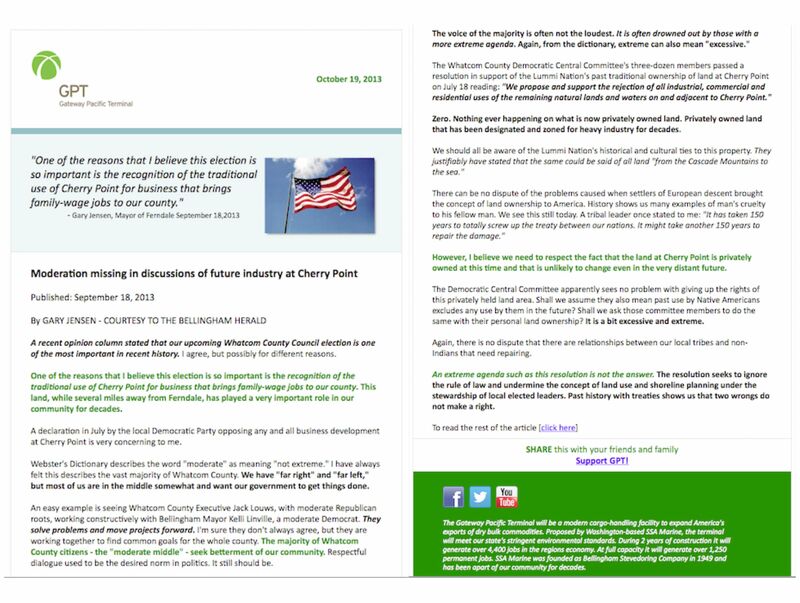 Mayor Jensen’s September 18 op-ed was featured in a GPT email promotional piece disseminated on September 19, 2013, via the SSA Marine/GPT email mailing list. 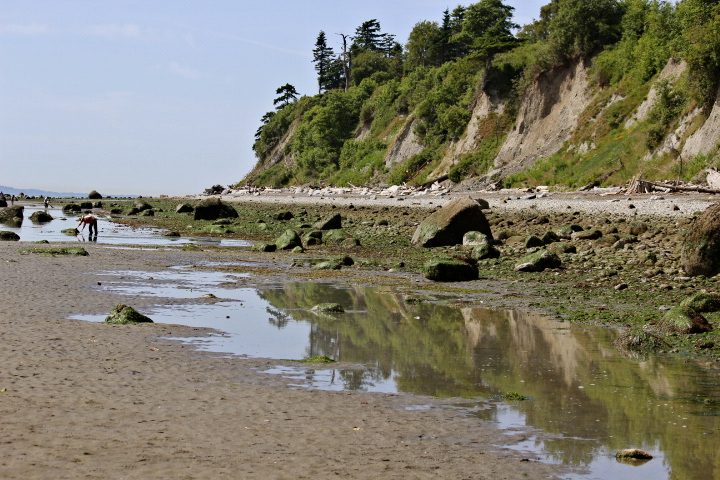 What seems extreme, is that the mayor does not support a resolution intended to honor the Lummi Nation’s sacred lands and waters at Cherry Point (Xwe’chi’eXen), a place which represents profound cultural, spiritual, and historical significance for their people. In his op-ed, Mayor Jensen wrote: “I can tell you many stories of what Cherry Point means to Ferndale and Whatcom County.” He went on to write three detailed paragraphs recounting the personal story of a particular Ferndale resident named Francis, who had worked at Intalco at Cherry Point for more than twenty years, and how Cherry Point had mattered to Francis and his family. Jensen did not mention the name of any Lummi individuals. He did not provide any personal histories that could have gone back countless centuries, that would attest to the Lummi’s committed protection of and reverence for the historical, physical, and cultural nature of Xwe’chi’eXen (Cherry Point). Hereditary Chief Tsilixw presented the historical and cultural case for a shared responsibility to protect sacred lands and waters at the 2014 Totem Pole Journey Blessing Ceremony. Photo by James Leder.